WHY ENTERTAINMENT AND SOCIAL ACTIVISM ARE NOT MUTUALLY EXCLUSIVE: A Conversation with the Yes Men about their Film, The Yes Men Fix the World, Playing the Sundance Film Festival. Combine the social disruption and confusion of culture jammers Improv Everywhere with the social awareness of Noam Chomsky, frame it as entertainment in a manner similar to Ali G, and you have a rough idea of how the Yes Men operate. Posing as a variety of authority figures, the group infiltrates shareholders meetings, press conferences, news broadcasts, websites, public speeches and a variety of other press outlets. Instead of focusing on simply embarrassing the companies or organizations which it infiltrates, the group acts as the voice of that organization––often telling the public what each organization should have said all along––taking responsibility for ethical catastrophes, economic irresponsibility, and environmental and social exploitation. This year at the Sundance Film Festival, The Yes Men’s new film, The Yes Men Fix the World, highlights the group’s illustrious pranks over the last five years, not to be confused with the 2003 film The Yes Men, which chronicles the group’s impersonation of the World Trade Organization. Rather, The Yes Men Fix the World broadens the perspective to corporations, government officials and media in general. It is a journal of the group’s antics from a 2004 BBC appearance, posing as a Dow Chemical representative, until November 2008’s imposter printing of the New York Times. 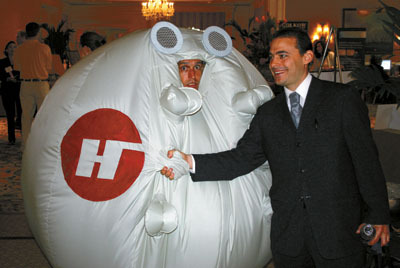 Take, for example, another prank documented in the film––“the Halliburton Survivaball.” Presented at a Catastrophic Loss Conference (undoubtedly a self-created venue for the prank), this ridiculous contraption is designed to protect corporate managers from the hazards of global warming. A detailed PowerPoint presentation highlights the abilities of the suit to harness wind power, hydroelectric power, power from living animals and combine with other Survivaballs to form a Megaball. The presentation left the business professionals attending the conference baffled, but the documentation of the event is at the core of the Yes Men’s ability to entertain the rest of us. “Our work is the documentation––we are not going to change minds at the conference––we have to document what we do and show it to the world. It wouldn’t really make sense otherwise,” Andy remarks. Those who can appreciate the irony of a company entrenched in environmental exploitation planning for corporate survival through environmental disaster would probably not be those in attendance at the meeting, but for the rest of us, it provides witty commentary paired with sketch comedy. The optimism is apparent in the youthful vigor and unstoppable enthusiasm expressed throughout the group’s multitude of appearances throughout various media outlets. Despite the realistically dim outcome of many of the actions, the awareness raised by each stunt begins a discourse that builds into a roar for change. While Andy acknowledges the frequent absence of direct response from their activism, the long-term benefits are apparent. Whether or not one agrees 100% with each and every Yes Men stunt, it is hard to not see the ethical violations that businesses and government hope so desperately for us to ignore. The Yes Men’s appearance at this year’s Sundance Film Festival will undoubtedly expose a new group of film watchers to a newfound criticism of globalization, commercial exploitation and legal ethics violations. Combined with the current economic crisis, the timing could not be more appropriate.